Fabio Petrone interviews Fabrizio Maglietta, managing director of SudCantieri S.p.A.
SudCantieri, which by many is still known as Nautica Maglietta, is without doubt one of the historic marinas used by pleasure sailors and not only Neapolitan based ones. In fact, for many of those cruising the Tyrrhenian coasts its structure in Pozzuoli is one of those so-called safe "bases" and not only from a mooring point of view. Everybody knows that here they will also find assistance, but not many know how you are structured, what kind of work you offer. So I would like to know from you how your company is organised at present, also from a logistics point of view. SudCantieri is a private marina situated in the centre of the Gulf of Pozzuoli, just a few miles from the splendid islands of Capri, Ischia and Procida, a centre of gravity between the Aeolian and the Pontine islands. We have room for up to 150 boats up to 50 metres in length and without limits to depth. Our services are top level, so advanced that they permit anyone wanting to do so to actually live on their own boat. The marine has columns with pre-paid cards for water, electricity (220V-380V), telephone and satellite TV. It has a fuel station, showers and toilets, VHF assistance on channel 72, an internet point and car park facilities. We also have day and night security service with CCTV, with access denied to unauthorised persons. Years of experience dedicated to boatyard work represent a guarantee for maintenance and repair work, employing specialised technicians able to work on any kind of engine and generating set, to check or fit electrical and electronic systems. The same applies for carpentry in wood and decks in teak, furnishings, internal and external upholstery, work in fibreglass with painting, anti-osmosis and anti-corrosive treatments. Refrigeration and air conditioning systems, insulation. An 80 tonne travel lift and relative trucks for 60 t and 80 t manoeuvres, permit large boats to be lifted and launched quickly and safely. The enormous fully equipped yards mean we have the space to store boats on dry land, without problems of having to wait and without limits on standing times. Huge modern warehouses offer winter shelter and work can be carried out under cover even on large boats. Italy builds lots of super-yachts that are sold all over the world. Many of these, however, don't go too far, they remain in the Mediterranean and remain moored for most of the year in ports that unfortunately are not Italian. 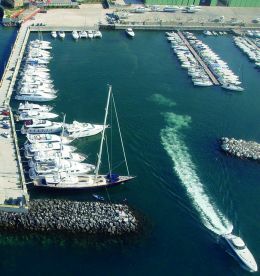 What instruments would make us more competitive compared to these marinas, how can we convince owners and above all their masters to change base? The climate in this city for most of the year permits mini winter cruises to the enchanting islands in the Gulf, without forgetting the Amalfi and Sorrento coasts, extremely beautiful in the summer but no less so in the winter. Our vicinity to the international Naples airport, only 10 km away and our geographical position, Cuma is nearby, just a few km away by car there are the archaeological sites of Pompei and Ercolano, the Vesuvius, the historical centre of Naples, make Marina SudCantieri an important reference point for pleasure sailing in our country and internationally. Marina SudCantieri's success continues each day through the work and professionalism of its staff, backed by one great common passion, the sea.